If you don't need a high-altitude endorsement, but you want to understand what happens to your body when you fly at higher altitudes, then this course is for you. Explains and refreshes you on high-altitude physiology. This course complies with requirements for those who need recurrent training in high-altitude physiology. Helps you meet the requirements of Part 91K, paragraph 91.1065(a)(2), Part 125.287(8), and Part 135.345(b)(5). Satisfies IS-BAO recurrent training requirements. 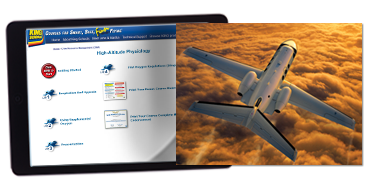 High-Altitude Endorsement Ground Training - Comprehensive course for initial training.